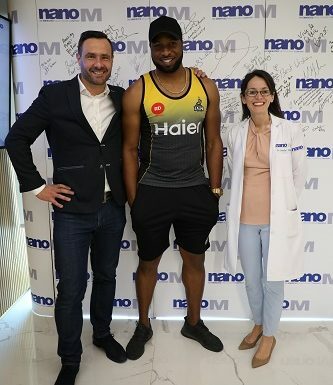 Cricketer Kieron Pollard, who plays for the Peshawar Zalmi Team in the Pakistan Super League (PSL), visited nanoM Healthcare, an Emirates Healthcare company, earlier this month. Pollard underwent a variety of health assessments at nanoM, the Dubai-based state-of-the-art sports and human performance facility, including an ECG, a BodPod test, 3D biomechanical analysis of his bowling and batting and a V02 max test – which determines the maximum amount of oxygen the body can use during physical activity. nanoM performs comprehensive assessments for amateur and professional athletes that play a variety of sports, including football, golf, cricket, tennis and mixed martial arts.